Ratings are averaged based on 44 reviews. Rooms a little tired and musty. We stayed at the Westin as a family of four (kids aged 5 & 9 yrs) and found this to be a great resort. The food was amazing! And the kids club was a hit (more so for our 5 yr old, but the 9 yr was very keen some of the scheduled activities too). The room was pretty small (although the bathroom surprisingly spacious) and the balcony so small it really serves no purpose (wouldn’t even fit a single chair). Staff very accommodating and friendly. Overall it’s a great place! Amazing service. Outstanding wedding venue. Not a negative thing to say about this resort. Everything perfect. Attention to detail - exceptional. The wedding co - ordinators at The Westin are amazing and delightful girls - thank you Nova and Lena. Would definitely recommend The Westin for a Bali wedding. Fantastic trip . Great accommodation and friendly staff. Excellent breakfast choices . Hotel was vary clean & modern . Would definetly stay there again . Highly recommend the Run Westin program . Ali, who manages the program did a great job .Great way to see Nusa Dua . This property was real 5 star. Staff were fantastic, happy, polite and attentive. Great for families and couples. Free shuttle service to Bali Collection if you don't want to pay hotel meal prices and a 5 minute walk to outside gate to markets. Really welcoming , comfortable and beautiful surroundings. Great with kids as they can roam safely, staff are everywhere but not in your face and are always alert. Made for a fabulous first trip to Bali - thanks. My family and I had a wonderful first trip to Bali staying at the Westin. The kids loved the kids club and it enabled us to get a gym session in, or a lazy relax by the pool. Fantastic resort, great location, friendly staff! Having been to Bali a few times and mostly staying in Legian, Seminyak we thought we would try Nusa Dua as it looked like a great place to take our 2 young children! The Westin blew our mind! All the pools, restraunts and rite on the beach! The staff were unbelievable. Every where you looked there was someone cleaning, gardening, serving or just looking to help someone! The buffet breakfast had a great selection! Kids club was outstanding, generally 5 staff working and open 9-5 come and go as you please. Enjoyed our stay at this wonderful resort. Excellent in all aspects but especially the staff and the service they provided. Very attentive and friendly. Thanks to everyone in the Westin for a super special time! We had 3 generations with us and it was a bliss being at Westin, it caters for all generations. They are so friendly, helpful and caring. Loved the rooms the service, not a thing to fault. Absolutely loved the happy hour mocktails at the pool whilst the kids were in the pool. Fantastic atmosphere, facilities and super friendly staff. Would go back in a heartbeat! Very clean facilities and staff very friendly. Well designed resort in a great location. Fantastic resort. Second stay there, absolutely loved it. Highly recommend it. Great hotel and services! Perfect for family with young kids. Pool great, kids club great. Just all really easy. We had a very relaxing trip. The Westin provides the perfect family accommodation. Our children aged 4 and 2 had endless fun in both the main and smaller pools. Us adults were well catered for too be it being served food and drinks by the pool or excellent buffet breakfast spread every morning. The premium room offered enough space for us and the customer service was exceptional. Highly recommend for first time family travellers who wants comforts of home but also plenty of offerings from a high end hotel resort. Not much to fault here when staying as a family. This was our 3rd stay at The Westin the staff welcome you back with smiles. We were amazed at how they all remember all our names and favourite meals and drinks. They go above and beyond for their guests and it feels so good. The kids loved eating at the Italian restaurant Prego and the activities within the kids club. Big family rooms. A great resort that is located in a quiet area with a lot of other resorts. Perfect for relaxing and only a short drive to kuta and surrounds. This was our 4th time staying at the Westin a Nusa Dua. As always it is a lovely resort. There have been a number of refurbishments done including restaurant where breakfast is served. The one thing that we have noticed is how much more expensive it is to eat and drink at the resort. $20 for a cocktail and $9 for a coke is very expensive. We ended up eating at other resorts closer by who also had very good entertainment available. 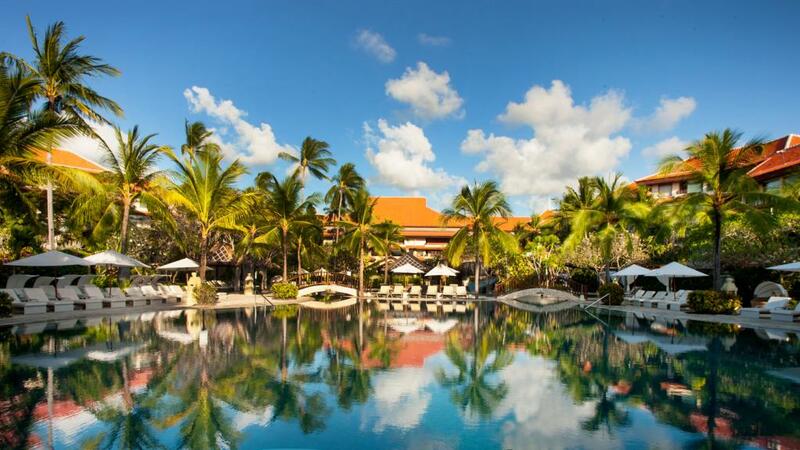 For our next trip we are tempted to try a different resort in Nusa Dua. We had chosen a Deluxe Garden Room, (have stayed before) but ended up in the Pool view. Two beds instead of the king size we wanted. and noise from family pool and kids club. great for families, but not for a couple. overall we love this hotel and will still visit again. Great location and rooms, great beds. Snorkeling off the sandy beach at high tide but need your own gear. Good restaurants. Hotel provided beach equipment for rental would help. What is nearby very variable but generally negotiable. Bali collection short walk and shuttle to Beachwalk mall in Kuta very helpful. In hotel ATM and bank. Staff very friendly. Good pools. Staff polite and service prompt, breakfast the best. We have stayed in this hotel many times and have always found it to be excellent with great staff and facilities. It was our fifth stay at the Westin every time we go we love it even more it's great with families lots to do for all ages. Everything was faultless - the staff, the hotel, the facilities and cleanliness. I can't wait to go back! The Westin Nusa Dua exceeded our expectation. Good Sized rooms, friendly staff with amazing water views and yummy food. Kids loved the swimming pool and we loved the cocktails. spl happy hour 5 to 7 with 50% off drinks. We celebrated our Wedding Anniversary, The Guest experience staff made it special with complimentary cake and Flowers. Highly recommended place with value for money. Lovely place to holiday with young children. Simply the best resort and the best hospitality. I travelled with my wife and my 20-months old daughter and the resort staff were great with kids. An amazing experience, will definitely go back again. WOW!!!! Beautiful hotel, excellent service, nothing was too much trouble. The food was delicious, especially the buffet breakfasts. Something for everybody, great location with a beautiful beach. Suit families and couples with lovely dining options. Service was excellent. The only item I can pick is that there were no in room movies available on demand. We were delighted and extremely happy with the hotel from every aspect. Food was amazing, room service was very efficient, room very clean and lovely grounds and beach. Only downfall was no free wifi in room. 1st hotel we've been to that we would definitely recommend to others and have many more stays as a family. We thoroughly enjoyed our stay at the Westin Nusa Dua. Service was amazing and one of the best family resorts ever !